Parkes Castle stands tall in Northwestern Ireland. Emblematic of both County Leitrim and Connacht Province, the castle offers history and scenery of Lough Gill in one exciting spot. Getting there from Dublin Airport takes approximately three hours if you choose to drive. Get behind the wheel of your car and head north on the M4 until Leitrim, where you'll veer onto the R202 through the countryside until reaching Parke's Castle in Fivemile Bourne. Parke's Castle is a plantation era structure that was built right on the banks of Lough Gill in County Leitrim. 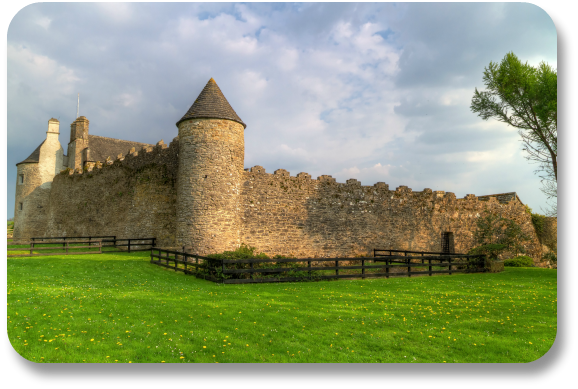 The pentagonal defensive walls of the castle, known as the bawn, date to an earlier castle, but the structure standing now was built in the 16th century. In centuries past, water would have lapped up against the bawn, and a moat was an integral part of the design. Today, Parke's Castle has been lovingly restored, and it is open to the public. It is definitely worth participating in the 40-minute guided tour to see as much of the interior as possible.